"...there is a possibility of failure at the Fort Peck Dam that could lead to a domino-like collapse of all five downstream dams in the Missouri River Mainstem Reservoir System. A portion of this interview is shown in a video, which precedes several short articles that provide much needed facts about the looming Missouri River flood and the nuclear menace. Nuclear experts are also issuing warnings, since the mainstream media has, for the most part, suppressed information on this life-threatening situation, minimized the dangers and assuaged the masses with false assurances. The final article on this webpage, “The Underwater Nuclear Disaster in the Midwest,” quotes retired nuclear physicist Tom Burnett’s assessment of the likelihood of radiation in the Missouri River. Fort Calhoun Nuclear Plant: How Bad Can It Get? 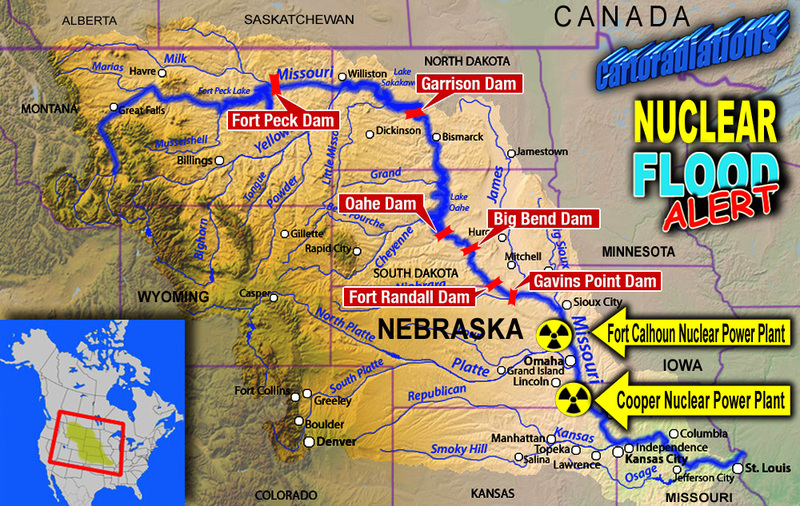 “Radiation, at minimum in the form of tritium, and more likely other particles and radionuclides, are leaking into the Missouri River from the Fort Calhoun nuclear generation plant in Nebraska. “I do not have proof. What I do have is the knowledge that every reactor is susceptible to small leaks at any time. Typically they are undiscovered and thus unreported... and hey, this is all sealed up anyway….except for that pesky water leak the NRC is upset about…but a little water can’t hurt…. “Until the plant gets submerged — or nearly so by a fast-running river which doesn’t cover the top (yet) but sure washes out all the leaky lines and the incomplete repair jobs which we didn’t care much about at the time because the river would never go that high. . .
“So we are all standing on top of the buildings watching water pour in one side and out the other... Tomorrow it might be 150 million gallons of water a minute. If the dams hold. But we all know they aren’t going to — they are are right at the top of the US DAM potential failure list. The ‘domino’ dams. “Let’s skip that. At least we know why there is a no-fly zone around the plant. Workers are being brought in by helicopter and boat — to the roof and to SECOND STORY windows — maybe third story by tomorrow. “Is that all? Not hardly. The Cooper nuclear plant can’t discharge sludge and it’s partially submerged just like Fort Calhoun. We don’t require any special knowledge to grasp what is going on. The plants have windows and doors and control rooms and pumps and heat exchangers and expended fuel pools. And they are all going underwater – but not like Fukushima where the water washed in and washed out. This is just going to get worse through August. "But it isn’t all bad. The Missouri river is cold enough to keep the pools and cores cool all by itself. And it’s also powerful to pull the fuel out and irradiate half the country." An expert on Missouri River reservoirs is sounding a very loud, very urgent warning about the chance of catastrophic flooding this summer. Bernard Shanks, an adviser to the Resource Renewal Institute, says the Fort Peck Dam and five others along the Missouri are already full with the Army Corps of Engineers releasing record amounts of water to prepare for snow-melt and heavy rain up-river. As a guest on KMOX’s Total Information AM Wednesday, Shanks was asked what he fears will happen should the Fort Peck Dam fail and set off a chain-reaction. He foresees a very real threat of “chest-high” water in St. Louis before summer’s end. Shanks’ main concern: that the Fort Peck dam, which he maintains is built with a “flawed design”, would be overwhelmed by snow-melt and heavy rains up north and give way, causing reservoirs downstream to collapse in a domino effect. “It would be the most epic man-made disaster in the United States,” Shanks replied bluntly. He says most of the dams holding back water along the Missouri River are 50 to 70 years old, and like people they tend to weaken with time. “I have followed this issue for 40 years, and I have never seen them more at-risk than they are today,” Shanks warned. The safety of the Fort Peck Dam recently was called into question by a columnist for a St. Louis website. Bernard Shanks, who is writing a book on the hazards of Missouri River dams, posted a column June 7 claiming that there is a possibility of failure at the Fort Peck Dam that could lead to a domino-like collapse of all five downstream dams in the Missouri River Mainstem Reservoir System. "It probably would wreck every bridge, highway, pipeline and power line, and split the heartland of the nation, leaving a gap 1,500-miles wide," Shanks wrote. "Countless sewage treatment plants, toxic waste sites and even Superfund sites would be flushed downstream. The death toll and blow to our economy would be ghastly." I have seen at least one man who has studied the dams for decades raise concerns that the likelihood of Fort Peck, especially, experiencing a failure increases with its age. That’s hardly a surprise. Here is what Bernard Shanks, an adviser to the Resource Renewal Institute, wrote in St. Louis Today earlier this week. Needless to say, it created quite a stir. The Fort Peck Dam is built with a flawed design that has suffered a well-known fate for this type of dam — liquefaction — in which saturated soil loses its stability. Hydraulic-fill dams are prone to almost instant collapse from stress or earthquakes. California required all hydraulic-fill dams be torn out or rebuilt — and no other large dams have been built this way since. At three miles wide, Fort Peck Dam last opened its floodgates 36 years ago. By the end of the first week in June, the U.S. Army Corps of Engineers will be releasing a record spill of water. The corps recently answered the question of possible failure with a statement the dam is “absolutely safe.” It may be the largest at-risk dam in the nation. What if Fort Peck Dam should fail? Here is a likely scenario: Garrison, Oahe and three other downstream earthen dams would have to catch and hold a massive amount of water, an area covering nearly 250 square miles 100 feet deep. But earthen dams, when overtopped with floodwater, do not stand. They break and erode away, usually within an hour. All are full. There is a possibility a failure of Fort Peck Dam could lead to a domino-like collapse of all five downstream dams. It probably would wreck every bridge, highway, pipeline and power line and split the heartland of the nation, leaving a gap 1,500 miles wide. Countless sewage treatment plants, toxic waste sites and even Superfund sites would be flushed downstream. The death toll and blow to our economy would be ghastly. There is very real threat of a flood that will leave St. Louis in chest-high water. The reason: Six old, huge, faulty dams that normally have reserve space for spring snow melt are nearly full now — before the spring floods start. Floodgates that haven't been opened in 50 years have begun to open. Flooding has begun. And the human and economic toll could be ghastly. Why another flood disaster? Six dams from Fort Peck in Montana to Gavins Point in South Dakota, authorized by the Flood Control Act of 1944, are in the process of failing at flood control. With spring water levels low, they can hold back more than three years of average Missouri River flow — enough to stop the worst floods and protect 750 miles of the Missouri River valley and heartland cities. This year, that is not the case. Let me give you a sense of scale. These reservoirs are massive. Four of the nation's 10 largest reservoirs are along the Missouri River — Fort Peck, Fort Randall, Garrison and Oahe. Three of these had less than five feet of total storage space behind the floodgates at the end of May. With a combined height of 700 feet, these three dams are nearly full. Melting snow surely will complete the task. With cities from Wolf Point, Mont., to St. Louis facing record levels of water, hundreds of thousands of people are threatened by the unprecedented opening of floodgates. The greatest fear is the massive Fort Peck Dam, a hydraulic-fill dam that is the largest of its kind. At three miles wide, Fort Peck Dam last opened its floodgates 36 years ago. By the end of the first week in June, the U.S. Army Corps of Engineers will be releasing a record spill of water. The corps recently answered the question of possible failure with a statement the dam is "absolutely safe." It may be the largest at-risk dam in the nation. Downstream, Garrison Dam never has had to use its floodgates since the dam was constructed 50 years ago. By mid-June, the corps plans to dump water equal to a good-sized river. The same is true for Oahe Dam, the next one downstream. Since the reservoirs are nearly full, the corps has no choice. Effective flood control from six large dams is no longer an option. As a corps representative said, "It now moves us into uncharted territory." We must all pose a question of national significance to the corps: What if Fort Peck Dam should fail? Years after Katrina and the New Orleans levee breaks, professional engineers and a federal court judge ruled the Corps of Engineers was to blame. Are we once again at the brink of a massive corps failure? The corps is infamous for management errors, caving to commercial pressure and losing sight of its primary mission. This pending threat is so huge that it is gambling with the nation's security. The corps is placing the nation at risk, and if the dams fail, Leon Panetta, who will become secretary of Defense later this month, will have the great Missouri Flood Disaster on his desk. And the entire nation will demand answers as to why the U.S. Army Corps of Engineers did not avert disaster with more economically and ecologically sound methods of flood prevention. Bernard Shanks, an adviser to the Resource Renewal Institute, has studied the six main-stem Missouri River dams for more than four decades. He has worked for the U.S. Geological Survey and served as director of the Washington Department of Fish and Wildlife. He has written three books on public land policy and is completing a book on the hazards of the Missouri River dams. Underwater Nuclear Disaster Underway in Midwest? "At the moment, things look stable, but if the flooding increases (or worse, an upstream dam fails) sandbags are not going to hold back the water." "… it isn’t all bad. The Missouri river is cold enough to keep the pools and cores cool all by itself. And it’s also powerful to pull the fuel out and irradiate half the country." . . .
As record floodwaters along the Missouri River drench homes and businesses, concerns have grown about keeping a couple of notable structures dry: two riverside nuclear power plants in Nebraska. “In Germany there is the testimony of a former Siemens engineer, which regularly penetrated … at high water levels of the Rhine water into the reactor building of Biblis,” says nuclear expert IPPNW [International Physicians for the Prevention of Nuclear War] Henrik Paulitz. Indeed, the radioactive releases into the Missouri River may well be taking place right now. If such is the case, we can be assured that the facts of this particular situation will only be revealed by the ruling “power system” as dictated by their “schedule” and desired “outcomes” — though it seems quite possible (based on the seriousness of events with these nuclear plants and the almost absolute media silence about it) that the “power system” has simply decided to “irradiate half the country” without ever bothering to tell “we the people” about it at all. This is an acknowledgement that fuel oil was (and perhaps still is) being released from a nuclear power plant in an “uncontrolled” manner, directly into the Missouri River. The statement about “no radiological contamination” is of course expected from the NRC, given there is no independent verification as to whether this claim is true or false. Such verification will require testing for radioactive contamination along the course of the Missouri River, so until this independent testing is done (if it is ever even done) it can be assumed that the NRC is not telling the truth (and based on all the experience with Fukushima, this is evidently an appropriate assumption). Although they have not used the loaded word of “evacuation” in this article it is obvious based on the actions of the Red Cross that an evacuation of people from their emergency shelter at Fort Calhoun is in fact taking place (and this evacuation may already be finished as of today). This video is definitely worth a look if only to see the seriousness of the massive flooding of the Missouri River, though the no nonsense summary of the threat to these two nuclear power plants is also one of the best out there. Missouri River floodwaters are less than three feet from reaching the site of a nuclear power plant in Nebraska, according to the U.S. Nuclear Regulatory Commission. Some of the grounds at another plant, which has been shut down since April, are already under water, the NRC stated. The Cooper Nuclear Station, which is currently operating at full power and the Fort Calhoun nuclear power plant are under an “unusual event declaration” by the NRC. “We are closely following events at both plants,” NRC Region 4 Administrator Elmo Collins said, in a prepared statement on Wednesday. “The licensee [OPPD] does not expect floodwaters to impact vital plant equipment,” the NRC stated. However, CNN affiliate KETV reported Wednesday that, as a precautionary move, the facility is keeping dozens of staff members onsite around the clock. The station reported that about 60 people are sleeping on cots at the plant and that the staffers are being rotated out every two days. So, this article confirms that the flood waters only need to rise less than two and a half feet (as more water has accumulated since the article was published earlier today) before the Cooper nuclear plant is also going to be under water (in addition to Fort Calhoun, which is already under water). Yet the news stories about the flood (such as that from KMTV Action 3) clearly state that the water levels are expected to rise at least another five feet! This confirms that no one at the NRC or OPPD is capable of doing even a simple math calculation with two single digit numbers, at least not when writing up any reports that will be quoted to the public. Also, note that the Cooper nuclear plant is continuing to operate at full power even when it is so obviously under great threat! It is difficult to find sufficiently descriptive words for such incredible insanity. What extra warning signs are needed as to the emergency situation that will inevitably be developing (once the plant is under water within days or weeks, given the expected rise of water levels by “five feet or more”) before they will shut down the plant and take every possible measure to ensure that it is as safe as possible?! Since flooding began on June 6th, there has been a disturbingly low level of media attention given to the crisis at the Fort Calhoun Nuclear Facilitynear Omaha, Nebraska. But evidence strongly suggests that something very serious has in fact happened there. So, we will have to wait and see what happens (and what is revealed publicly, if anything) relative to these two now partially submerged nuclear power plants that are both experiencing “unusual events” (= “events that may well mark the beginning of even more nuclear catastrophe” — after a little Newspeak decoding). The situation is certainly not looking good as of today. Prayer (or any similar invocation, if you are not inclined to prayer) for a wholly benign outcome to this extremely dangerous situation is definitely positive and useful. Also, helping to break the media silence by informing as many people as you can about these events is essential. If people do not get hip to the incredible dangers of all nuclear technology such that we are collectively able to make the only sane decision relative to nuclear power — the decision to bring a complete and permanent end to the “nuclear era” (and immediately!) — then planet Earth may soon be so utterly irradiated that it will be hostile to all life.